The last couple of weeks have been filled with beauty. Labor Day weekend with family in town, MINUS SPACE’s opening on Saturday of Bibi Calderaro’s project entitled Pineal Action IV. On Sunday, we participated in the Komen’s New York City Race for the Cure. It was such a special day, Central Park was covered in pink! I can’t explain how it happens, but one tends to complicate life and get tangled in the “rat race”. Suddenly, what we love to do becomes a chore. The Tarahumara’s secret is exactly what I want to remember daily. To always love everything I do…including just doing absolutely NADA. 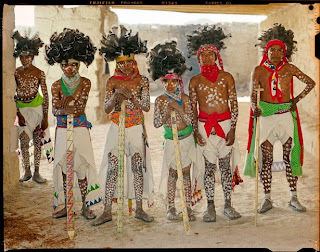 Tarahumara men costumed for rituals. Photo from National Geographic’s article, A People Apart by Cynthia Gorney. Photograph by Robb Kendrick. Great post! And that image is just incredible. I've never seen anything like it. Hope to have some NADA time soon to share with you and mister mister.